With the release of Stripes U.S. forces now access to a number of light armoured units like the LAV, HUMMVWs, Sherridan tanks along with new Infantry options. On the horizon more NATO forces will be released this year and they bring with them similar units and capabilities. So what’s a good communist to do? Mount up. The BTR-60 at first glance is much less capable than either variant of the BMP, and there is a good reason for this, it is. This doesn’t mean it lacks a place in lists and on the table, where BTR-60 Infantry can add great depth, variety and efficiency to lists. Recently I took a BTR-60 list to a small local tournament, and while it took some getting used to, it outperformed all my expectations (and my opponents) and has quickly become a welcomed unit on my table.. So what makes a BTR-60 company different? Cost, capability and efficiency. BTR-60 Infantry are cheap, at 5 points for a minimum sized company they are the cheapest Infantry option with vehicles. This savings can be vital when building lists that eat up points quickly like T-64 or T-72 formations. While options like the additional spigots do bring the cost up, the resiliency they bring is incredibly valuable, but we’ll talk about them later. A cheap infantry unit like this is simple to add to almost any list and gives you a cornerstone unit to ensure formation morale. When taking multiple minimum sized armoured units it’s very easy to quickly find yourself with no units in good spirits, but a cheap Infantry company can hold you in a game for a duration of time that proves it’s value far outweighs its cost. Small cheap units like this also make excellent flankers, either being held in reserve or being pushed up table early in games, they provide a cheap problem that the enemy must devote resources to. BTR-60 companies have two main differences which are vital to understand in terms of capability. First and foremost the BTR-60 is not a BMP. The BTR-60 has lower armour, a less powerful gun, no missile, is slower cross country, has a worse cross rating and generally has less vehicles in the unit than their BMP comrades. After you get past that the BTR-60 company is awesome. When you purchase a BTR-60 company you have three choices to augment the unit, first and foremost you can purchase a Gremlin missile stand for 1 point to help bolster your Anti Air assets, this gives you a light anti air weapon with great range and an additional BTR-60. Secondly, like BMP-1 units the AGS-17 which excels at suppressing enemy Infantry both in the offence and the defence, can be purchased along with an additional BTR-60 for 1 point. At last, but certainly not least and similar to the Afghantsy Infantry you can take not one, but two stands of AT-4 Spigots, each with a BTR-60 for 2 points apiece. At first glance this may not seem like a big deal, but upon closer inspection this changes the way these motorised troops can fight. BTR-60 companies can defend while adding resilient offensive power across the table. Each Spigot stand is ROF 3 with AT 19 FP 3+ at a range of 40’’, while not the best weapon to attempt to destroy Main Battle Tanks, these missiles are excellent at destroying most other things (including lighter tanks like the Patton or Leopard 1), and can help control movement lanes on the battlefield. These excel at destroying AAA assets along with Anti Tank assets like TOW with sheer weight of fire at long range. What makes the spigot teams even better is now Soviet missile teams can be dug in, making them incredibly resilient. If you’ve ever been frustrated trying to dig out milan teams, prepare to hand some of that anger back. Soviet forces love to attack and while you push forward more often than not these teams will either be ignored in favour of firing on closer concerns or will enjoy the benefit of being far away and as such limiting the fire that can be put into them. 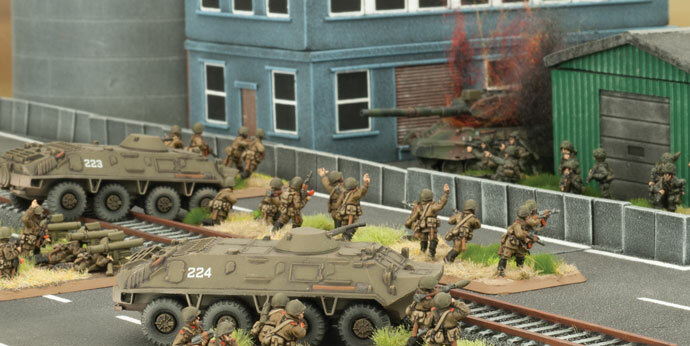 With a BTR-60 company armoured formations can push one side of the table while your infantry hold one or both objectives, while suppressing enemy armour. 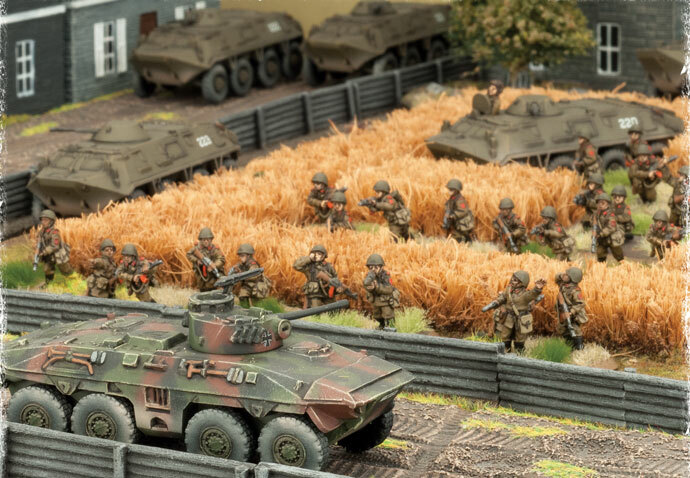 With medium sized or larger units you can leave the spigots and Gremlins behind (perhaps with a few support stands) on an objective and push forward with the bulk of your Infantry to threaten enemy objectives, all while BTR-60s hunt light armour, contributing three elements to the battle with ease. So then what makes unlike the BMP the BTR is not a multi-role vehicle. While on roads the vehicle is shockingly fast and can road dash up to 40”, but they can’t do this within 8” of enemy units, and commonly tables lack multiple arteries of major roadways so use of this can be somewhat limited. When tables do offer the use of this, the threat of a total repositioning of a large unit of BTR-60s can force opponents to set up more defensively than normal and buy you a turn of movement. Off road the BTR-60 is much slower than its BMP cousins, where its cross country and terrain dash are by comparison quite limited, which along with a 4+ cross rating means you probably want to keep your BTRs out of most terrain. Lacking a missile and having a 14.5mm and 7.62mm machine gun the BTR-60 has a specific target set on the battlefield, namely Infantry and lightly armoured or un-armoured vehicles. With AT 5 and a ROF 3 while stationary, and 2 on the move, packs of BTR-60s can pour fire into enemy positions, pinning and digging out Infantry and bailing if not destroying light armour with ease. Against infantry the BTR-60 Company simply rocks. The sheer amount of fire you put down with FP 5+ digs out infantry quickly and effectively, combine this with the artful use of terrain and a smoke screen or two and you’ll find yourself melting Infantry platoons. While I’m not one to assault with Soviet infantry in my last tournament I ran BTR-60 Infantry and their ability to gun down key units and then assault and push back defenders won me the final against dug in British Infantry. We were both stunned at the efficiency of the unit. It forced him to make choices, fire at all giving up gone to ground and doubling the number of hits I’d get in my turn, and how to divide that between the BTRs and the Infantry, in the end there wasn’t a really good answer and the Infantry company swept through the position. Against most anti air units, artillery, many APC and anti armour units this weapon is perfect and can force opponents to reposition or put fire into the BTR-60s instead of more valuable units like the T-72. Often opponents will ignore BTR-60s to fire on higher priority targets, allowing you to get closer and cause major damage to the supporting units listed above. 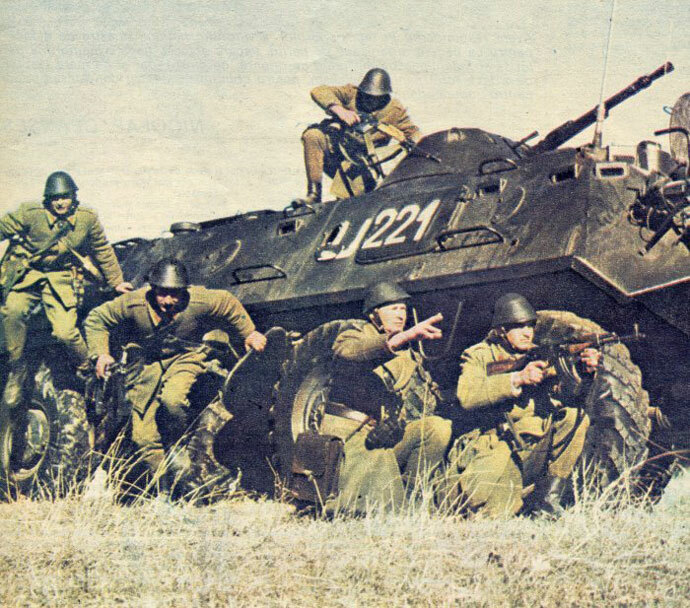 Most varieties of Soviet lists I find work best by taking out the support units, which then allows the heavy hitters to focus in on the meat of an army, and the BTR-60 is a cheap and efficient support hunter. As the game grows and we see more nations and equipment being introduced we see more and more light equipment on the table. With the introduction of Stripes for instance, American forces now can add HUMMVWs to their force in number for cheap. With 6 units of these coming in at 19 points the HUMMVW adds nimble firepower like TOW at a fraction of the cost of other units. The BTR-60 is an excellent counter to units like this and the LAV which also comes out of stripes. With two medium sized BTR-60 Companys coming in at only 20 points, you have two resiliant 8 vehicle platoons which were made to gun down these capitalist vehicles, and you still have two good sized companies of Infantry on top of that which also pack weapons more than capable of fighting themselves. If you’re not going to run a BTR-60 formation (which you can get 3 full companies and the HQ for only 46 points), then you should think about adding a Company as support to any Soviet list you’re running. BTR-60 companies can add to any list, where they bring unmatched flexibility, efficiency and resiliency to the table. Both the T-64 and T-72 formations can take a BTR-60 Company in support, but as part of your support any formation can be augmented by a BTR-60 Company, and this is where things start to get really interesting. You can add a BTR-60 Company to a BMP Company or a second BTR-60 Company to a Tank formation. A minimum sized Company at only 5 points is never a wrong purchase, but when you add in 2 spigot missile teams and add in a gremlin AA missile team you have a support unit that can lend fire anywhere on the table while holding down an objective. If you’re defending you have 6 BTRs that can sit back and strike as the enemy closes in or push forward to help take out enemy support vehicles. In a tank list a unit like this brings you so much flexibility, anchoring your list to an objective and giving you staying power. 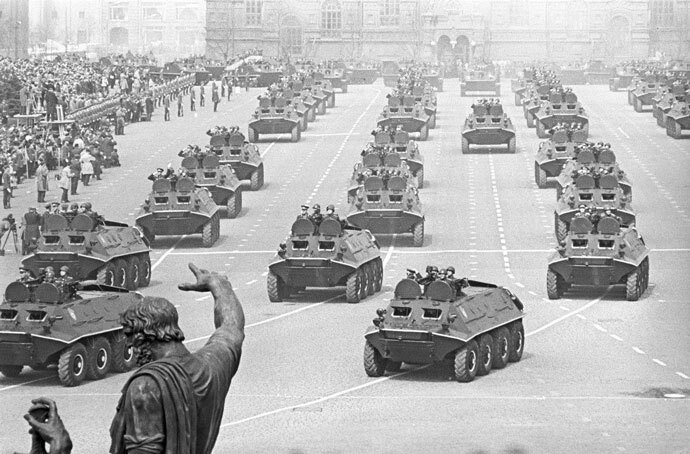 A medium unit of Soviet Infantry is never a bad option, never. At only 10 points getting 15 stands of Infantry backed by 8 vehicles has never been cheaper. This is an objective taker and it will dig out any Infantry foolish enough to stand between it and an objective. 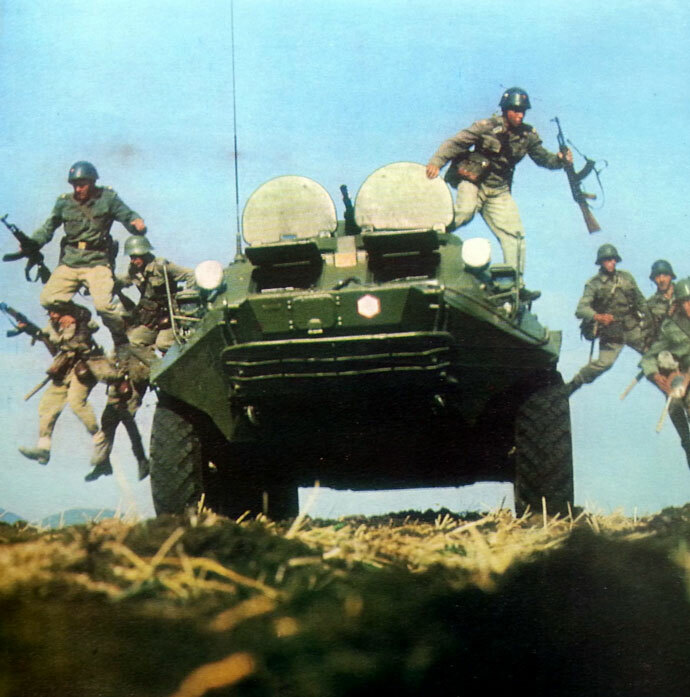 8 BTR-60s will also scare LAV and HUMMVW platoons. Defensively this is a tough unit to crack and can force an opponent to commit most of their force to dealing with it. 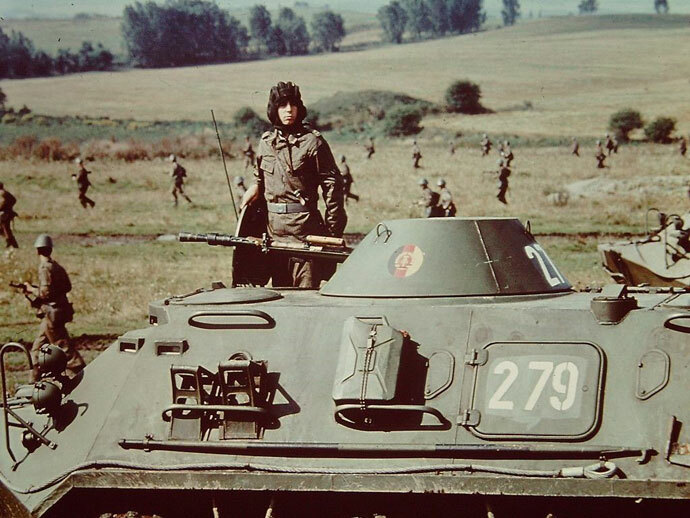 BMP infantry was what got many Soviet players into the game, but BTR Infantry is opening the door to changing the way Soviet player can deal with new forces. By simply adding a few transports to your collection you can completely change the way your force plays and present a whole new Soviet force quickly. The BTR-60 Company is the Swiss Army knife of the Soviet force. It may not be the best tool in the box, but it is one that can do it all and it’s affordable.